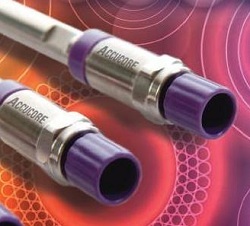 THE NEWEST member of Thermo Fisher Scientific’s Accucore range of HPLC columns, the C8, has a shorter alkyl length bonded phase than the equivalent C18 phase. This gives lower hydrophobic retention and, says Thermo, enhances chromatographic performance without generating excessive operating pressure. The result is that laboratories can expect better sample throughput and higher quality results. The company recommends the Accucore C8 HPLC column for analytes with medium hydrophobicity, and says it is compatible with all high-performance liquid chromatography (HPLC) instruments. Thermo’s Core Enhanced Technology utilises solid core particles of 2.6um diameter to deliver high resolution separations at high speed, and with backpressures significantly lower than those associated with UHPLC (ultra-high performance liquid chromatography). It says its advanced particle bonding technology and automated packing process results in excellent peak shapes and minimised secondary interactions.